Just returned from a long weekend break here at the Triton Hotel. Fantastic weather for December. A great room, very comfortable but very dissapointed with the food as it was not what we expected from a 4* star rated hotel. I would certaianly consider staying there again as facilities and location are great but I think that we would go for Bed and Breakfast next time. This hotel is a 1961 vintage, the outside has been painted and looks good. The food is super and the rooms are clean. But the rest Oh dear the stair cases are filthy the desk staff are bolchy we arrived in our room and the waste bin was missing the TV had no RF lead so we could not watch it but worst of all the lock in the pation door was faulty and would not lock. It took 5 visits to the reception and over 2 days to rectify all the probs. The setees in the public areas are old and jaded the dressing table in the room was scratch to glory. On a better note the outside areas were very nice, but this hotel needs a lot of money bringing it up to scratch. People in the area recomended the Sciroco just across the road. We had a room overlooking pool and gardens, it got the sun from about 12.00 till dusk. Food was very good with plenty of choices. Staff were courteous and pleasant. We did not go to hotels shows so cannot comment. Would definitely return to this hotel, we had a great holiday. This was our second visit to the Triton and our third to Benalmadena. We have just booked again to go in October. Benalmadena is very hot in July/August (as is the whole of the Costa del Sol) we first went in July/August last year with 3 teenage girls. We went back in November with another couple and again in April this year,just the two of us. The rooms are spacious and very clean. It seems that most people prefer to look out over the pool but they really should try the other side of the hotel it has wonderful views over the sea, square and marina and you get the beautiful sunrise. There are lots of very nice bars and restaurants around. Plenty of things to do. The room has a mini fridge and they did not seem to mind that we put our own water etc. in and did not buy any of theirs. The hotel has a very relaxing atmosphere with plenty of space to sit and enjoy the sun the shade and a nice coffee or beer. We loved it!! Which is why we are going back for a third time. We have just come back from a off season trip the hotel was very clean and well looked after. The rooms were brilliant, and loads of space. Meals were quite nice, but as good as any other hotel. I would surely recommend this hotel to anyone. The porter met us at the door and escorted us and our luggage to our room which was comfy and spacious. Two three quarter size beds you could lose yourself in and a decent size TV, rather let down by only having Eurosport and a News channel in English. The cleanliness was faultless with fresh towels and soaps left daily. Good choice of food in the large restaurant and pancakes and eggs fried while you wait for breakfast, as were delicious lamb and pork chops and tuna at dinner. Strange though that they were unable to boil an egg properly at breakfast. The location was very good-just a few steps up from the prom. The large pool was being refurbished while we were there but the roses around the other pool were in full bloom in January!The Gymnasium is worth a visit with Jacuzzi,Sauna,Steam room and two small pools. The entertainment was good, especially the parrot show. We found the hotel very pleasant and comfortable although it was a bit dated in decor - showing its age a little - the food was excellent with buffet being replenished often. There was loads of choice in what you could have with show cooking every morning at breakfast and at dinner at night. There was a great variety also. Staff were very pleasant and helpful. The only complaint we had was that there was only one bar open during the two weeks we stayed there - the bar on the ground floor lounge was never open, but that was really the only complaint we could make. 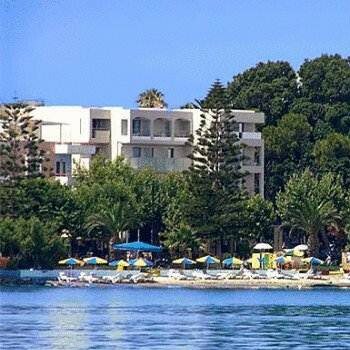 The hotel was situated with easy access through the gardens to the promenade where you could reach the beautiful marina quite easily. All in all we would reccommend this hotel to anyone. Hotel Triton - what can we say? A pleasant suprise and one we will be returning to. We stayed on half board basis. Every meal was a treat. For a larger older hotel the cleanliness was outstanding. Location was excellant a just a short walk to the stylish Marina. The rooms are very appointed with large balcony's. The bathrooms are very clean with the towels changed daily and shower gels etc replenished every day. The pool area was large and uncrowded with beautiful settings and very well kept. Pool towels are provided. Entertainment is poor but this should not be a distraction as there is plenty to do in the surrounding area. All in all an excellant holiday that has been recommended to friends and family and as I have already stated one we shall be returning to this year! Although this is an old hotel, I was particularly impressed with the rooms. They were clean and spacious, the balconies were a good size, the air conditioning was excellent, the bathroom was very clean with a good powerful shower. The bathrooms were replenished every day with towels, pool towels and shower gel/shampoo etc. There is a good fridge and a secure safe and plenty of wardrobe space. I only marked cleanliness as 4 rather than 5 as some parts of the hotel were in need of renovation. The hotel itself was clean enough, but there was a small derelict section around the pool (possibly used to be an out door bar/bbq area) that could do with some revamping as it is just a waste of space really, and the corridor that joined the main part of the hotel to the second building was in need of something to liven it up. We did stay half board, but we ate out a couple of times too (there are some lovely fish restaurants). The half board option is a good option though. There is a lot of choice both for breakfast and dinner. We ate out on occasions as sometimes we like to make a night of it and eat out late. Times for breakfast were 8.a.m. to 10.30 a.m. and dinner, 7.30 p.m. to 9.45 p.m. The location of this hotel is what gives it the advantage over others in the area. It is right next to the buzzing marina, right on the beach, and most rooms (from what we saw) had a sea view of some sort. The very busy main road runs at the back of the hotel, and some rooms face it but there are few of them. We had a lovely pool/seaview room. We could hear the noise of the traffic on the balcony but once our doors were closed the sound proofing was excellent. I don't know what it would be like though if you had a room that was nearer to the road. We arrived at the hotel at 3.30a.m. in the morning. The hotel reception staff were very friendly. They sent us to the restaurant for refreshments that had been left for our arrival. The pool area is very good. There is a very large sea water pool and a smaller freshwater pool, with two paddling pools. The sunbeds are plentiful. There was an animation team when we were there, but there were very few english children. I liked the fact that this hotel had a very good mixture of nationalities. This is the mark of a very well run hotel in my opinion. Something for everybody. We never stayed to watch the entertainment as it was mainly entertainment staff orientated and we are a bit past that, so I can't really comment, but there never seemed to be anything on in the evening that tempted us to want to stay there. We are travelling back to this hotel in October with a group of friends and their families. Although I wouldn't say that the facilities in the hotel were geared up for children, the location makes it so that there is plenty for them to do outside of the hotel, e.g. Tivoli world, sea life centre, beach, crazy golf etc.